We’ve been kicking the idea for this blog for a little while now. A short piece around the difference between employer value proposition, employer branding and recruitment marketing. Just a few thoughts to help add a little clarity around these popular subjects. It comes from the fact that many of our conversations with clients start something like this. “Mark, we need to develop an employer brand”. That’s not that surprising when you consider that 60% of the traffic to our website comes from people searching for ‘employer branding agency’. But, as popular as the term is, it’s not necessarily one that we’re comfortable with. After all, we’re not a factory that creates employer brands. What we do is discover what it is that makes you a great place to work and turn this into meaningful marketing that will, in turn, influence your reputation as an employer. This helps develop your employer brand. “An employer brand can be neither created nor destroyed, but it can be influenced from one state to another.” The first law of employer branding. See, that chemistry degree hasn’t been wasted. And that’s where we need to start. Finding out what state it is in now. Because by knowing what your reputation as an employer is now, and how if differs from the reality of working for you, we’ll know what work needs to be done to get you to where you want to be. And what we’ll need to do enhance and influence your reputation. So the question becomes slightly different, “Mark, we want to attract, engage and retain the very best talent in our sector. How do we do that?” Great question. I’m glad you asked. I’ll explain. Without knowing the answer to this question, how could you possibly hope to meet the expectations of you target job seekers? Your proposition should be the foundations that your talent acquisition strategy is built upon. And you can’t build anything without strong foundations. See, that engineering degree hasn’t been wasted. By talking to people inside and outside of your business, you can quickly get a good idea of the things that make you a great place to work. Universal themes that can be supported through the experiences of your people. Compelling stories that can be used to build meaningful employer marketing. What? We haven’t done anything; how can we have one? Oh, but you have. Your employer brand is what people already think of you as an employer. They’re forming an opinion about you right now. And you don’t even need to work for an organisation to have a view of their employer brand. It’s often down to perception. Something they’ve heard or seen. Just as you might have a view about a shop or restaurant. But the good news is that you can influence that view. But only if you really understand what you have. And that takes us back to the importance of you defining your employer value proposition. And, as your HR Director will be pleased to hear, it’s not just about attracting talent. A powerful execution of your employer brand also engages and retains existing employees. So, how do you bring your employer brand to life? 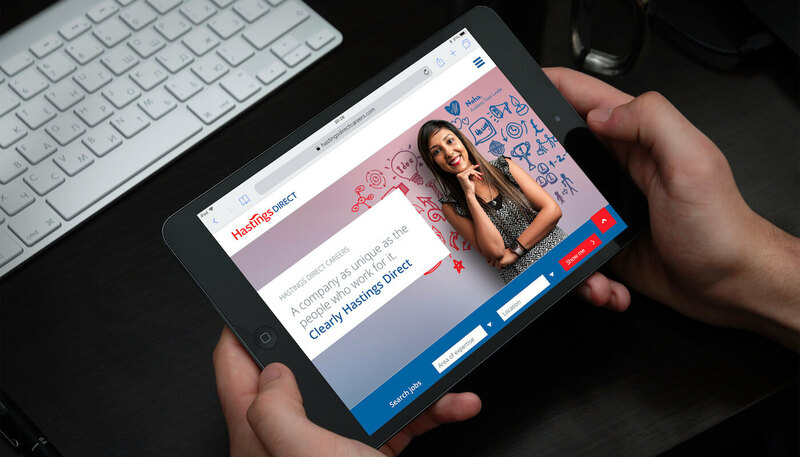 The secret to successful recruitment marketing comes from delivering a compelling creative message to the right candidates – at the right time, in the right place and on the right device. But it’s rarely that simple. Today’s candidate journey is like any other customer journey – and customers tend to be pretty choosy where they spend their money – or, in this context, invest their talent. A typical customer journey will start with some form of awareness of the product, service or role, then interest may pick up, they’ll start to evaluate what’s on offer, maybe look for some proof and, if it all stacks up, may decide to take things further. So, you can immediately see why nailing your proposition is so important. It will inform so much of the messaging, so it needs to be realistic. Good recruitment marketing needs to attract and nurture candidates through the process using a number of channels, but there are plenty of stages where candidates can lose interest – even after they’ve gone to the trouble of applying (more of that later). The holy grail of marketing is to create inbound enquiries from customers who are already part way through their purchasing journey and have ‘bought into’ the brand. Recruitment marketing should be no different. Your compelling proposition articulated through your careers website, social media activity, job board advertising and the way you engage your current employees will all raise awareness of your brand and help attract more informed talent. But despite of all of the above, it’s very easy to cancel out all your earlier hard work. How? Just give your candidates a poor experience. It seems crazy to have to say it – but just as shoppers get turned off by poor customer service – candidates will react in very much the same way. I’ve been working in the recruitment industry for almost 20 years and I’ve seen supply and demand go in cycles. In the ‘olden days’ when demand was low, but candidate supply was high, some employers thought they could get away with treating candidates almost as a nuisance. The successful candidate was deemed lucky to get the job and unsuccessful candidates rarely heard anything. There was never any connection made between a poor candidate experience and how it would damage the candidate’s perception of the overall brand. That was then. Today, the candidate experience is a whole subset of the employer brand experience and an industry of its own. It’s all about delivering a recruitment process that leaves candidates with a positive impression of you as an employer – whether they are successful or not. Get it right and you’ll create goodwill that retains not only their interest in you as an employer – but potentially their business as a customer too. Get it wrong and they’ll be on Glassdoor and all over social media. So, how does it all fit together? Well, your proposition informs your recruitment marketing which in turns influences your employer brand. It captures why your people choose to work for you instead of somewhere else. There will be little gems in there that will feed into your employer brand as well as some things you can address and improve. While your recruitment marketing works to bring your proposition to life and takes the candidate through a journey from consideration towards commitment. Just as conventional marketing does. But it doesn’t stop there. Your candidate experience needs to be great too. To deliver on the promises you’re making through your recruitment marketing. No matter what the outcome, you need to know that the candidate has enjoyed the experience of engaging with you. That positive experience will improve your reputation. And your reputation as a place to work is your employer brand. See, those 20 years in employer branding and marketing hasn’t been wasted.